Never. On steep/slippery ramps it's nice to be able to engage the electric trailer brakes when backing down. I'm seriously considering your experience as I try to decide what to do. I mostly put the boat in salt water. Are you going into salt water? How long have you been doing this? Any preventative maintenance performed? Brand recommendations? Dexter is a popular US brand, but I'm not convinced the brand really matters. Ebay has the best prices. On my last boat, we splashed 80% of the time in salt and the brakes lasted over 5 years. When it was convenient after salt water, I'd dunk in fresh water on the way home for a rinse. If the boat was going to be put up for more than a month or so, I'd run the lawn sprinkler under the trailer for an hour after salt. Early on, I made up a flushing system using fresh water from my boats tank but quit using it because they're so easy and cheap to replace, it's not worth the effort to go to a lot of maintenance rigmarole to extend their life. If you really look around it is possible to find electric brakes that use galvanized backing plates and galvanized or zinc coated drums. That said, it depends on the salinity of the water where you are located as well. This idea may work in some places and not others. The attraction of electric brakes is the simplicity of the set up and cost. Also they are a lot more controllable than surge brakes. However, your tow vehicle must have a brake controller so some of the cost is made up there. I have used drum brakes in salt water and they do take more maintenance for sure than disc brakes. However, don't think that you can neglect disc brakes either, if not maintained you will have issues with the caliper pistons sticking and guide pins sticking same like drum brakes with corroded wheel cylinder pistons. Thalasso and jakwi like this. It's really very tempting. I do have a brake controller, so that isn't an issue for me. I've looked at the Stainless Kodiak disk setup, but it looks like about $900 for the whole setup. That is beyond my reach right now, but $200 is much more achievable. I'm in Daytona going into the Halifax/ICW at the Dunlawton bridge. Thats a few miles from the inlet, so while it's definitely brackish, I don't really know how salty it is exactly. I’m old enough to have had cars with drum brakes. I know how well they work when wet. I pass. Why is your boat special? You can’t hardly buy an equipment trailer without drum brakes. My 10,000lb dump trailer and 14,000lb equipment trailer stop fine with an electric set up. Show me a camper that comes standard with hydraulic disks. Please don’t tell people it won’t work when you don’t really know. Magnets don’t care if they are wet. Standard surge hydraulic brakes don’t work backwards or when the trailer is down hill of the truck. So no brakes when launching. They are affordable and work and much better than nothing. If your tailights can work under water so can your electric brakes. FYI not all Electric brake controller’s are created equal. The prodigy brake controller happens to be much better and much more sensitive at sensing when you need more brakes. A break controller that is not adjusted properly or is of poor quality will make it feel like you have no breaks or apply to much at the wrong times. For saltwater you would have to find something much more rust resistant. However I have seldom seen a hydraulic set up on any sort of vehicle that didn’t require maintenance every four years or so. Cars, trucks, trailers, whatever. The road salt and ice solutions in New York are horrendous. Nothing is maintenance free here. for freshwater I can tell you personally experience it works great and I would not have spent five times as much to do something better. And also put brakes on every axle. I can lock all four tires on the trailer on any surface. I don’t know how I could get any more braking force. If you are reading this thread and I are debating about what type you can get and are budget conscious and want something DIY friendly and can get parts really anywhere, consider electric. Oh and if you follow any trailer guideline you’re supposed to take your axles apart every year for greasing. Bearing buddies do not substitute for routine maintenance. So if something was to Rust or stick or come apart it would be observed. jeffnick and jakwi like this. Being an electronics guy I know that an electromagnet will work fine under water, and that electricity takes the path of least resistance. Even in the presence of salt water the path of least resistance is the copper winding. The failure point is when the copper is exposed to salt water and corrodes, and eventually opens electrically, despite popular opinion that doesn't happen instantaneously. At that point the magnet doesn't work and neither will the brakes. Those magnets are $50 or less so if I can get two or three years out of them it is definitely a cost effective path. 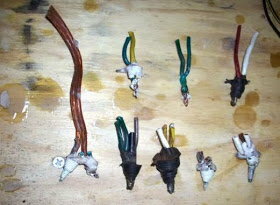 I tend to get two or three years out of the trailer wiring before the copper corrodes to the point of being useless. If I'm diligent about my connection points I might get a little more. Aside from that the next failure point is rust in the mechanism. It seems to me if I give them a good vinegar water rinse afterwards and a yearly inspection/cleanup and paint they should hold up pretty well. So from a cost perspective I'm looking at less than $200 for a set of new brakes for the initial investment vs $7-900 for a hydraulic setup. Even if they fail completely and rust totally out to the point of needing complete replacement every two years it would still take 6-7 years before I'm starting to approach the cost of the hydraulic setup. I'm guessing that the Hydraulic setup will at the very least need some work after 6 or 7 years. Anyway that is my thought process. I really appreciate everyone that has chimed in with their experience and sorry to the op for hijacking his thread. I use wire nuts filled with caulk (5200, silicone, latex whatever is handy). When I put electric brakes on the second axle of my tandem trailer I decided to rewire the whole trailer. This gave me a chance to see how well the wire nuts were doing. Not one single case of water intrusion or corrosion.